For all you dog owners out there… we know how worrying it can be when your dog is acting up or out of the ordinary. It can often be difficult to understand the root cause of their changed behaviour. Especially if nothing significantly traumatic or noticeable has occurred to make them behave unusually. There are various tactics to help soothe an anxious dog, such as physical exercise or removing them from stressful situations. However, sometimes you’ll need to consider special supplements designed help relax your pooch. We’ve got you covered with our complete guide to calming supplements for dogs, and our recommendations for some of the best ones on the market. Zesty Paws Calming Bites are made of a completely natural and organic formula. And it won’t be tough to get your dog to eat them. The fact that they’re turkey flavoured and so easy to chew makes it much less difficult to convince your dog to munch on them, even when they’re feeling anxious. These bite-sized calming supplements are made of a host of ingredients that are proven to soothe and calm the mind. The mostly organic ingredients include organic ginger root and organic passion flower. One of the key ingredients in these calming bites is Suntheanine, which is L-Theanine in its pure form. L-Theanine is known to relax the mind without causing any drowsiness. The addition of organic chamomile also works well to soothe a hyperactive dog who may be displaying signs of excessive energy. 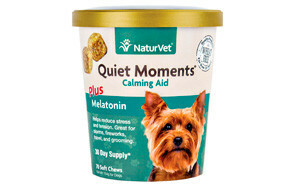 NaturVet Quiet Moments calming supplements contain melatonin to help promote a relaxed state of mind for your dog. Combined with a mix of thiamine and L-Tryptophan, NaturVet Quiet Moments supplements also include ginger to support those dogs with more sensitive stomachs. NaturVet advises that you offer your dogs these supplements at least 30 minutes before they are about to face a potentially stressful situation. This can be difficult as you never know when an unpredictable situation could stress your dog out. Each chew does contain a host of great active ingredients that are known to have soothing benefits, such as passion flower and chamomile. This popular calming supplement by Vetri Science Laboratories contains a host of ingredients that are recognised to promote calm and relaxation in your dog’s mind. The formula includes ingredients such as thiamine and l-theanine, as well as colostrum. According to VetriScience, you should see the effects of the calming tablets within 30 minutes and it can last upto 4 hours. If you know that your dog may be about to experience a potentially stressful situation, you can give them one of these at least 30 minutes before to prevent any undue anxiety. The fact that VetriScience Laboratories has clinically proven results is reassuring for those of you who may be new to world of calming supplements for dogs. They’ve also advised that their product is safe enough for daily use over the long term for dogs that are more prone to anxiety. Chew is chicken liver flavoured so your dog can enjoy it as a treat! Particular Paws sell their calming supplements in an easy to chew format, with active ingredients including thiamine mononitrate and l tryptophan. They also include natural ingredients which are widely recognised for their calming benefits. These include chamomile flower and passion flower. This completely natural calming aid is safe to give your dog on a daily basis without any worry of causing drowsiness. The product is a great mix of organic and active ingredients in a nice and chewable format. If your dog is starting to display symptoms of anxiety, these powerful active ingredients can work quickly to soothe and calm them as needed. These soft chews are designed to offer your pooch some natural stress relief when needed. Their chicken flavour and easy to chew format makes them feel like a bit of a treat for your pet as well. In fact, they’ve even called the product ‘treats’. The Plano Paws Calm Treats are also a great choice if you’re looking for a calming supplement that’s gluten free. They don’t contain any sugars or salt at all, making this one of the healthiest options out there. 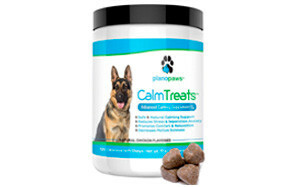 Plano Paws Calm Treats are made of 5 ingredients which are designed to calm. These are Valerian root, l-tryptophan, organic chamomile, organic passion flower and organic ginger root. The formula has been created to safely and quickly calm and relax a stressed out dog no matter how riled up they may be. How Do I Know Whether My Dog Is Suffering from Anxiety? First things first, how do you even figure out if anxiety is the issue with your dog? If you’re unsure why your dog is acting up, have you considered that it could be anxiety? Anxiety in dogs is actually much more common than you might think. There are a number of anxiety symptoms to watch out for, such as excessive barking, overlicking, or more aggression than usual. Read on to find out a little bit more about some of the most common symptoms. Seeking solitude: If your dog is hiding or isolating itself from other people and animals more than usual, it could be experiencing feelings of anxiety. Some dogs just want to be left alone when feeling anxious and may retreat or hide from fear. Panting or shaking excessively: Though it’s fairly common for dogs to pant (especially after a run or a bit of exercise), look out for signs of excessive panting. Similarly, if you find your dog shaking or quivering excessively, it’s likely that it may be feeling quite anxious. Howling or barking excessively: If your dog is making a lot more noise than it usually does, and for no good reason, it could be due to anxiety. This is especially true if they continue to bark incessantly, even after you try and calm them using your usual tactics. Out of character aggressive behaviour: If your dog doesn’t usually display signs of aggression and suddenly begins to, this is the most obvious sign of anxiety. Watch out for out of character aggressive actions such as sudden growls or snapping. Hyperactive energy: Anxiety in dogs can often be spotted if they are suddenly extremely energetic and hyper. Panic attacks: If your dog is suffering from severe anxiety, they might have a panic attack which can last a few minutes or even a few hours. During a panic attack your dog might display any or all of the above symptoms. Separation anxiety from their owners: if your pet is usually quite close to you and displays signs of attachment, they may suffer anxiety when you’re separated. Being around loud noises such as fireworks or thunderstorms: This is a major cause of anxiety in pets especially when the noise is sudden or unexpected. Social anxiety in stressful social situations with other people or other animals: Many dogs can get riled up when they meet another animal, especially if the other animal displays signs of aggression. Genetic disposition – some breeds tend to be more prone to anxiety. Usually dogs with higher emotional intelligence tend to suffer with problems of anxiety and stress. Past traumas, fears or phobias: If you adopt a dog that may have suffered a traumatic or abusive past, it’s likely that their anxiety of such situations reoccurring will linger for a while. It may also be that your dog has a specific phobia or fear that causes them to be anxious. Recognising what your dog could be afraid of helps greatly, as you can offer them a calming supplement before they face any situation they may be afraid of. Do Calming Supplements For Dogs Actually Work? Calming and anxiety supplements for dogs are now widely available in different forms including liquid, capsule, and powder. The supplements are made of a mix of herbs and nutrients that are known for their calming benefits. Various studies have shown that these herbal supplements are proven to have a naturally soothing influence on an anxious dog. Though the supplements can have a powerful effect when your dog is suffering from chronic or more serious anxiety issues, there are other tactics that can help those who may just suffer from occasional or less severe anxiety. For instance, regular exercise (both physical and mental) can be hugely helpful when it comes to soothing or relaxing an anxious dog. The calming supplements themselves are most effective for your dog when combined with regular exercise and proper care. If your dog is still displaying symptoms of anxiety after taking the supplements, or is displaying more severe symptoms, we’d recommend that you visit your veterinarian to get their professional input. The anxiety could be a symptom of something more medically serious that should be looked into. When you’re considering which calming supplements to give your dog, we’d recommend going for the most natural option available, which includes a number of active ingredients with calming benefits. You also want to offer them something which a nice flavour which is easy to swallow. This will make it much simpler for you to try and convince your dog to eat them, especially if they are in an extremely anxious state. Anything too strong which will cause your dog to be drowsy or even unconscious should definitely be avoided. If your dog is suffering from severe anxiety, the next step after natural calming supplements is to visit your vet. They will be able to help you find a long-term solution that is safe for your dog and deals with the root cause of anxiety. If you have a pet which you haven’t had since it was a pup, there may have been abuse at the previous home which may not have been detected. Whatever the reason for the anxiety, your dog needs to know that you love them and that they can come to you when they’re feeling a little stressed out.